Once again, we present to you an introduction of one of our SCGG Planning Committee members. Unlike many other conventions, SCGG is run by members of the community instead of by a business or store. Each of us comes from a different niche in the tabletop hobby, but we all have a passion for wargaming and bringing people together to have good times throwing dice. Jason got started sometime in 2007, when he walked into a game store, saw people rolling dice and moving miniatures around flock-covered tables laced with fancy terrain, and said "how do you play this game?..." Fast-forward over 9 years later, and here he is, working with the convention planning team on making year four of the Salt City Gladiator Games, a reality. the growing forces of angry werewolf druids of Circle Orboros in Hordes -- why does this guy seem to vacillate to creatures with fangs and tails...? 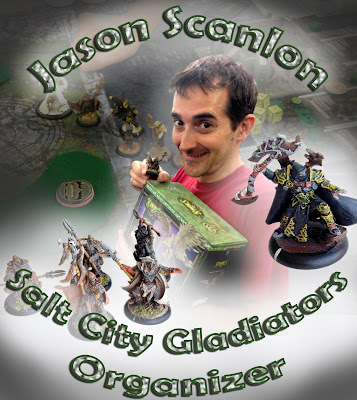 Throughout the course of his dice-rolling, super-glue-messing, tape-measure-stretching, evil-grin-honing, eternal-paint-job-noodling table-top-gaming career, Jason has always been intrigued with the organized play experience. He has even tried several (largely unsuccessful) personal attempts at writing and running a couple of narrative campaigns (but they were fun while they lasted!). While he would not consider himself a very competitive player, he has frequented many tournaments with the goal of meeting new fellow gamers, and playing more nerd games than his tired brain can handle. For SCGG, Jason has served in several planning capacities, from store relations to venue selection to terrain construction. Wherever his talents and enthusiastic personality are needed, Jason will be there. We have many more bios coming for you in the future. Be sure to say hello and shake our hands as we are out and about in the community. We look forward to seeing everyone at the 2017 Event! 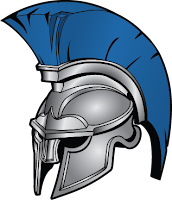 Planning for the 2017 SCGG is in full swing, but while we are waiting to get some of the details hammered out, the SCGG Planning Committee wanted to take some time to introduce ourselves to the community who may or may not know us by name and face. Unlike many other conventions, SCGG is run by members of the community instead of by a business or store. Each of us comes from a different niche in the tabletop hobby, but we all have a passion for wargaming and bringing people together to have good times throwing dice. So, without further ado, here is the first of the SCGG Committee Bios! Captain Morgan has been in the wargaming hobby since his wee days of painting horses for his dad's Napoleonic miniatures. Chris has had a long and sordid love affair with the wargaming hobby, but settled on the universe of Warhammer 40,000, and more recently Horus Heresy, where the majority of his gaming passion lies with the Blood Angels faction for both systems. Even so, he owns a mighty and stout army of dwarves from the Lord of the Rings game sets, among other (a holdover love of the bearded warriors stays strong after playing Hero Quest so much as a kid). The promise of a good time rolling dice with good people with good models is enough to get him to try any system. In addition to working on the SCGG Committee, Chris also is a panelist on the Forge the Narrative Podcast (known as the FTN Librarian for his love of the stories and fiction), writing articles for FTN, Bell of Lost Souls, and Frontline Gaming from time-to-time. 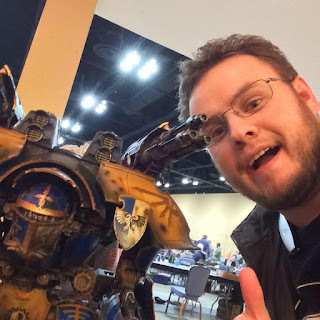 For SCGG, Chris works as the Head Tournament Organizer for the 40k Narrative and Competitive events, which he has headed for the last two years. The 2016 SCGG saw the 40k Championships reach Grand Tournament status, and Chris is looking forward to keep growing the event with big changes in the 40k scene on the horizon. Additionally, Chris is hoping to get more opportunities to come and play in more events put on by the community in general, and maybe add a Horus Heresy event this year as well. We have many more bio's coming for you in the future. Be sure to say hello and shake our hands as we are out and about in the community. We look forward to seeing everyone at the 2017 Event!